Nice interpretation of the song's meaning by Will Burns writing for Forbes. Think about John Lennon ’s lyric in his famous utopian anthem Imagine , “Imagine all the people living life in peace.” It’s a nice thought, but how does one imagine that, exactly? When people are living life in peace are they just sitting around smiling at each other? Is peace just the absence of war? If so, it’s not enough. 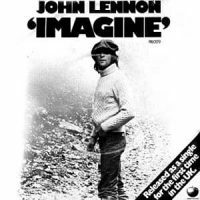 I think the operative phrase in Lennon’s lyric is “living life” – as in, “Imagine all the people (actively) living life in peace.” The real damage of war is that it prohibits people from actively living their lives. Imagine what would have been created had some form of war not prohibited it. Imagine gets a bashing in this article (as well as some Beatles songs) which I think is harsh http://nypost.com/2016/10/28/i.....-all-time/ It's not the first time I've heard people state they dislike Imagine but it surprises me as I think it's a great song. Are the lyrics a little too idealistic? Musically it is a very dull and boring song. 'Imagine ' is an ok song that has been shoved down my throat so much under the impression it's world changing that I got fed up of it. Throw in Yoko's incessant ploy of marketing John's legacy on the song to the point that you get a totally false image of John's life and it becomes a total irritation. To me John has far better and more significant solo pieces of music that define his catalogue and life. I'm still surprised at the responses as I don't regard it as dull and boring and I don't get tired of hearing it. I think it's a great melody. I also think John once deflected some of the alleged hypocrisy in the lyrics by stating that our "possessions" are not necessarily physical but also mental. Or was that a cop out? I think Imagine is a songwriting feat. It has a very nice tune with simple chords and simple lyrics, with few other artists having written about such idealistic themes and gotten away with it. I think it's a pretty decent song. The problem is, it's overplayed and over marketed. 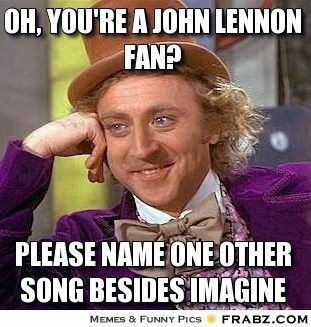 I'd probably like it more if it didn't define John Lennon and his legacy. I mean when people talk of John Lennon , that's the only song that's referenced. He had so many other great songs that it makes me sad that Imagine is now the definition of his music. Instant Karma is another John Lennon solo song that's fairly popular even to this day and Don't Stop Believing is a million times more overplayed than Imagine . Might be because Don't Stop Believing is a better song. I feel like people would know Love before Instant Karma . Most people that I know, only know Imagine . It's only a bloody song, as John said. It's really not. 'DSB' is an excruciatingly painful song that is now played anywhere you go seemingly regardless of the circumstance or event. It has more life to it than Imagine . Sounds like everyone was asleep while making it. Also John doesn't have to be Imagine . It's a fantasy like if I sang a song about walking on walls. Not believing in heaven/hell, past/future and wanting social justice & peace is a fantasy? I mean the whole song is Imagine if this happened, Imagine everyone living in peace, Imagine no hell below us, The whole song is about imagining what a world like that would be like. I think the philosophy behind the lyrics (perhaps borrowed from Yoko) was that the first step to making something a reality is to imagine it. Maybe it's another way of saying "Don't be scared to dream".